Share the post "Interview: TIM ARNOLD"
Tim Arnold has just released a new single ‘Change’ and here we catch-up with Tim to learn more about the single’s video that features mime artist Lindsay Kemp, plus his musical plans for the coming months. How did you get to work with the mime artist Lindsay Kemp? I first read of Lindsay Kemp in a book about Kate Bush by Fred Vermorel. I was sitting alone in the basement of the McDonalds on the corner of the Tottenham Court Rd, huddled over an Egg McMuffin in 1987. I was 12 years old, away from my mother’s home in Spain for the summer holidays and devouring as many albums and books from London charity shops as I could. Through Kate Bush, I also discovered Gurdjieff and Ouspensky, as well as the great Colin Wilson. But it was always the mention of Lindsay, an almost ethereal being from another world, that sparked my imagination when I began to study the roots and foundations running through English pop culture. The first time I saw Lindsay, I was on the set of Kate Bush’s film The Line, The Cross and The Curve. I was 17. My older brother was working on the production and he invited me along to watch. I remember it well. It was the first time I had seen a Papaya. There was a lot of exotic fruit used in that film. I remember seeing Kate, Miranda Richardson and Lindsay in my brother’s monitor and also in person, between their takes. At the end of the shoot, I felt elated and inspired, as if having seen a glimpse into a creative future. I also lived on Mangos and Papayas for a week after that. In 1996, I wanted to work with Lindsay on the video for a song I was releasing with my first band Jocasta. The song was coincidentally called ‘Change Me’. At the time I was obsessed with mime. But the record label wouldn’t allow it. This was the first of several dreams I had that would have to be put on hold. But when your creative instincts truly do come from the very centre of your soul, you never forget them. And you never abandon them. Lindsay and I finally met last year at one of his shows in London. I was so honoured to discover he had even heard of me, and had listened to my album The Soho Hobo. He said he loved the songs I’d written about Soho. It totally blew my mind and when we discovered we had so much in common, we knew we had to work together. With the difference of 4 decades, Lindsay and I actually both lived on the same street in Soho and we shared the same passion for the place. I suppose our love of Soho brought us together. Last year, one of my parents passed away - Toni, the lady who raised me alongside my mother. In all the years we spent together, Toni never mentioned that she and Lindsay had worked together – in Soho – as dance partners. So meeting Lindsay has been like meeting someone new from my extended family. The family that I thought was getting smaller, but has suddenly grown again with his magical appearance. What gave you the idea to combine two art forms, music and mime together? I’ve always designed the artwork for my albums but it’s only in the last 5 or 6 years I’ve started making my own videos as well. These days, I tend to write the video before I’ve even finished writing the song, so the two are becoming part and parcel of whatever it is I’m trying to express. It doesn’t mean I don’t collaborate on the visual side of what I do, because I really need that input from experienced experts who I have worked with and been mentored by over the years. But I do trust myself now.Change is so emotionally powerful, that I never wanted to feature myself in the song. It came from a very personal place when I wrote it 3 years ago. But with anything you create for an audience, it’s imperative to depersonalise or the audience can’t walk through the experience as if it’s their own. Not with all songs, but definitely with ‘Change’. I’ve worked with some incredible actors on my albums (Richard Briers, Benedict Cumberbatch, Gary Kemp) and I have always been mesmerised by their ability to change their expressions so gradually, from one emotion to another. It’s like magic to me really. I admire that talent. I have never been able to easily display my own emotions on my face, which is probably why people often get the wrong impression of how I am feeling when they see my face. Anyway, I really did think it would be wonderful to see those small changes created by one performer on camera as a response to the lyrics in the song. Lindsay’s ability to seamlessly move from one expression to another is a dance of the face itself. And in all of his performances, he becomes a mirror for the spectator. I believe that is the moment when an artist can say he or she has mastered their art. To become the canvas for everyone else’s imagination. That’s always been my dream. Many times I have thought how wonderful it would be to turn everyone’s laptops and mobiles into mirrors for the imagination. Lindsay Kemp is a mirror for the imagination. 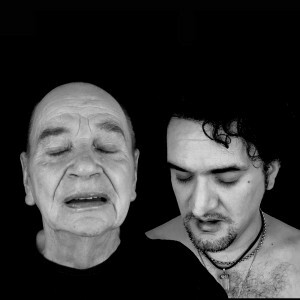 The video to ‘Change’ is very moving, both in the lyrics and Kemp’s mime. Are you pleased with the results? When I filmed Lindsay and each of them had a tear in their eye at the end of the song. When I am directing, I need an emotional distance because of all the technical concerns and also because of my own approach – of trying to view whatever I am creating through the eyes of everyone except me. However, once I was alone in the studio with the raw footage and syncing up the mastered music to Lindsay’s performance, it shattered me from inside and I cried my eyes out. For many reasons, but the main reason I’m proud of the video is because, if you watch and listen from beginning to end, uninterrupted, it connects your heart to your mind in a way that deep down, we all wish we did more often, including me. It’s transformational theatre that’s only available online. As a one off artistic collaboration between Lindsay and myself, I think ‘Change’ is quite unique and will be a lasting tribute to Lindsay’s magical art. You have three albums due out this year. There has been the classical one, ‘Sounds To Pictures’, released in February. What has the reception been like to this? Sounds To Pictures has had a great start. It’s been featured by both Apple Music and Spotify on their chilled out and relax playlists, which, if anyone who knows me will find fairly amusing as I am not particularly well known for being chilled out. So, in that alone I feel there has been success. When Jonathan and I finished the album, we agreed that I would start the project with videos that encouraged the listener to close their eyes, listen to the music and then write down what they had seen in their mind. And it worked. People took part in the experiment. I love imagining each listenerllooking into the commercially driven world of their web browser and…closing their eyes to it all, and then listening to some beautiful music played on an array of historical violins. And it was so rewarding to see all the responses. That people were sharing parts of their imagination was a great privilege to be a part of. It feels like the beginning of a truly stimulating conversation. I have heard a lot of people like to meditate to the album. I will probably try that myself if I make time. What are the other two albums you have planned this year? I want to thank those fans who keep sending me amazing Vegetarian recipes online. I don’t always have time to answer everyone, so I’d like to say how appreciated it is. I am a life long vegetarian and I do not get as much time to explore new recipes like I used to, so please keep sending your Veggie tips. look forward to seeing you at the next show! This entry was posted in All Posts, INTERVIEWS, Interviews/10 Questions and tagged Change, interview, Kate Bush, Lindsay Kemp, music, pop, singer songwriter, Tim Arnold. Bookmark the permalink.